1. I hereby declare that I accede to the Dominion of Pakistan with the intent that the Governor-General of Pakistan, the Dominion Legislature, the Supreme Court and any other Dominion authority established for the purposes of the Dominion shall, by virtue of this my Instrument of Accession, but subject always to the terms thereof, and for the purpose only of the Dominion, exercise in relation to the State of JUNAGADH (hereinafter referred to as ‘this State”) such functions as may be vested in them by or under the Government of India Act, 1935, as in force in the Dominion of Pakistan on the 15th day of August, 1947, (which Act as so in force is hereinafter referred to as “the Act”). 2. I hereby assume by the obligation of ensuring that due effect is given to the provisions of the Act within this State so far as they are applicable therein by virtue of this my Instrument of Accession. 4. 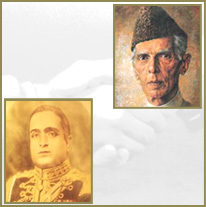 I hereby declare that I accede to the Dominion of Pakistan on the assurance that if an agreement is made between the Governor-General and the Ruler of this State whereby any functions in relation to the administration in this State of any law of the Dominion Legislature shall be exercised by the Ruler of this State, then any agreement shall be deemed to form part of this Instrument and shall be construed and have effect accordingly. 5. Nothing in this Instrument shall empower the Dominion Legislature to make any law for this State authorizing the compulsory acquisition of land for any purpose, but I hereby undertake that should the Dominion for the purpose of a Dominion law which applies in this State deem it necessary to acquire any land, I will at their request acquire the land at their expense or if the land belongs to me transfer to them on such terms as may be agreed, or, in default of agreement determined by an arbitrator to be appointed by the Chief justice of Pakistan. 6. The terms of this my Instrument of accession shall not be varied by any amendment of the Act or of the Indian Independence Act, 1947, unless such amendment is accepted by me by an Instrument supplementary to this Instrument. 7. Nothing is the Instrument shall be deemed to commit me in any way to acceptance of any future constitution of Pakistan or to fetter my discretion to enter into agreements with the Government of Pakistan under any such future constitution. 8. Nothing in this Instrument effects the continuance of my sovereignty in and over this State, or, save as provided by or under this Instrument, the exercise of any powers, authority and rights now enjoyed by me as Ruler of this State of the validity of any law at present in force in this State. Given under my hand this Fourteenth day of September, Nineteen Hundred and Forty-Seven. Date this Fifteenth day of September, Nineteen Hundred and Forty-Seven. 1. The Naval, Military and Air force of the Dominion and any other armed Forced raised or maintained by the Dominion; any armed forces, including forces raised or maintained by an Acceding State, which are attached to, or operating with, any of he armed forces of the Dominion. 1. External Affairs; the implementing of treaties and agreements with other Countries; extradition, including the surrender of criminals and accused persons to parts of His Majesty’s Dominion outside Pakistan. 2. Admission into, and emigration and expulsion from Pakistan, including in relation thereto the regulation of the movement in Pakistan, or persons who are not British subjects domiciled in Pakistan or Subjects of any Acceding State; Pilgrimages to places beyond Pakistan. 1. Posts and telegraphs, including trunk telephones, wireless, broadcasting, And other like forms of communication. 2. Federal railways; the regulation of all railways other than minor railways In respect of safety, maximum and minimum rates and fares, station and service terminal charges, interchange of traffic and the responsibility of railways administrations as carries of goods and passengers. The regulation of minor railways in respect of safety and the responsibility of the administrations of such railways as carriers of goods and passengers. 3. Maritime shipping and navigation, including shipping and navigation and Tidal waters; Admiralty jurisdiction. 6. Aircraft and air navigation; the provision of aerodromes; regulation and organization of air traffic and of aerodromes. 7. Lighthouses, including light ships, beacons and other provisions for the Safety of shipping and aircraft. 9. Extension of the powers and jurisdiction of members of the Police force belonging to any unit to railways area outside that unit. 1. Elections to the Dominion Legislature, subject to the provisions of the Act and of any Order made there under. 3. Inquiries and statistics for the purpose of any of the aforesaid matters. 4. Jurisdiction and Powers of all courts with respect to any of the aforesaid matters but, except with the consent of the Ruler of the Acceding State, not so as to confer any jurisdiction or Powers upon any courts other than courts ordinarily exercising jurisdiction in or in relation to the State. Copyrights © 2019 Junagadh Secretariat. All rights reserved. Website Developed by One Top Solution.